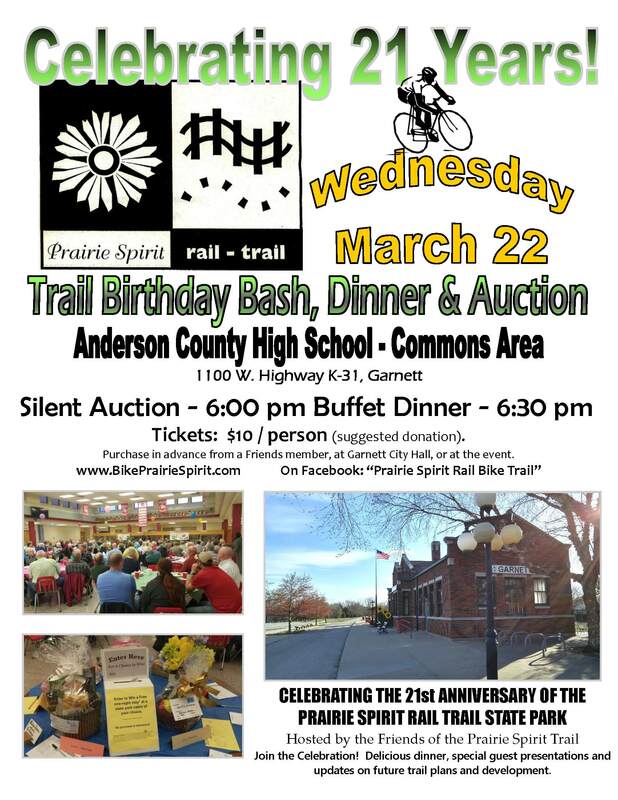 The Friends of the Prairie Spirit Trail are holding a 21st Birthday Bash on Wednesday, March 22nd in Garnett. Tickets for the event are $10 per person and can be purchased at Garnett City Hall, through Friends group members, or at the door during the event. The buffet dinner includes smoked brisket, scalloped potatoes, a variety of salads and delicious dessert. The 21st anniversary celebration is a public event and everyone is cordially invited. The Friends of the Prairie Spirit Trail invite you to show your support of the trail and the communities along the Prairie Spirit by attending.